Most of the pre 1950 gravestones have been photographed but as the church was locked none from the interior. There are some well-preserved 17th century gravestones; the earliest found was that of Joan Chapman who died in 1666 and was born in 1586. 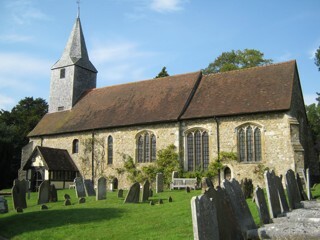 Full inscriptions of many of the pre 1920 gravestones have been published by the Kent Archaeological Society and can be seen at http://www.kentarchaeology.org.uk/Research/Libr/MIs/MIsKemsing/MIsKemsing.htm . The GPR holds 169 grave and 493 person records for the burial ground.